Our two volunteers on this project were Iris de Jong, an optometrist, and Ellen Blom, an orthoptist. This was Iris’ first mission. Ellen on the other hand is a seasoned volunteer who has worked on many volunteering projects. 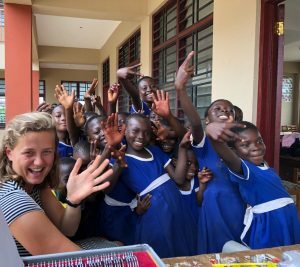 This was her second stint in Ghana with The Optical Foundation. On Saturday 2 June 2018, the pair who used to work as colleagues at Eyescan in Amstelveen, The Netherlands, boarded a flight to Ghana on behalf of The Optical Foundation with 4 suitcases full of frames, reading glasses, sunglasses, vision cards and eye drops. The mission of this project was to provide comprehensive eye examinations for some of the poorest children and adults in collaboration with the eye clinic in Jachie, while offering optometry students the opportunity to gain more practical experience under the supervision and guidance of our experienced volunteers. Over the course of two weeks our volunteers set up makeshift examination spaces at 8 different locations and performed comprehensive eye examinations on 1757 people. After meeting their assigned teams at the eye clinic, our volunteers’ first visit was to the “School for the blind” at Akropong. 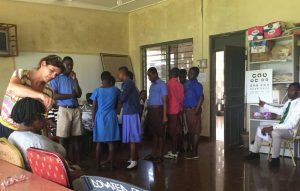 Although there was not much they would be able to do for these students, visiting the school had a great impact on these socially rejected individuals who have all been shunned from their communities due to the stigma around blindness in Ghana. 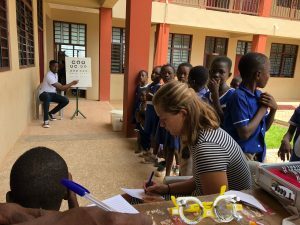 This even more so underlines the importance of The Optical Foundation’s vision to make eye care accessible for everyone (especially children) in Ghana.Out of the 107 children and teachers screened, a total of 9 pairs of glasses were prescribe and only 5 cases had no ophthalmic abnormalities. The following day’s project was at the St. Andrews Anglican Church in Jachie. On arrival our volunteers were met by queues of people patiently waiting to have their eyes examined. Having such a large attendance offered a good opportunity for one of the local optometrists to address the crowd with educational information on glaucoma, cataract, eye hygiene, etc. before the examinations commenced.On that day, 92 comprehensive eye examinations were conducted and mainly reading glasses were prescribed. A private school in Aputuogya was the next destination. 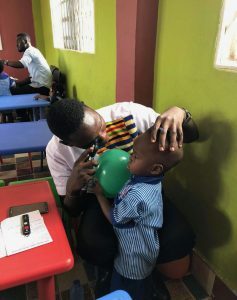 Using a retinoscope and an ophthalmoscope, our volunteers were able to investigate the power of the eyes, their motility and detect any media clouding and retinal abnormalities in the children in the crèche and nursery classes.Comprehensive eye examinations were also conducted on the older children as well as the teachers and a few parents. Of the more than 400 children examined, 58 children were referred to the Eye Clinic for glasses or additional examination. The next locations required our volunteers to be split up into two teams so they could concurrently provide examinations at two different locations in Akwaduo. Iris went to the village where she examined 42 people, mainly elderly people with glaucoma and cataract. Ellen performed eye examinations at the church. Once Ellen and her team were finished they went to a new location in Bosomtwe where they were later joined by Iris and her team. Their joint efforts accounted for another 107 eye examinations. Their next destination was St. Luke’s Anglican school at Tanoso, which is a school with more than 900 pupils. They spent a total of two long days performing eye examinations. It was such a big task that they didn’t even get an opportunity to eat their lunch in order to be able to examine most of the students. On their last day our volunteers went to Aprinkra – a poor village approximately one hour from Jachie. These were mainly old people for which our volunteers were providing comprehensive eye examinations. It was noteworthy that many people complained of itchy and burning eyes, so many eye drops were prescribed. All up it was a successful mission.